A new national report shows Indiana moved up to second place nationwide with jobs tied to advanced industries. The Brookings Institution findings show more than 365,000 Hoosier jobs are directly tied to the advanced industry sector. "America's Advanced Industries: New Trends" details 50 industries within the sector. In last year's report, Indiana ranked third in work force share and rose this year to second. Central Indiana Corporate Partnership Chief Executive Officer David Johnson says "most of the 50 advanced industry sectors line up squarely with the CICP's sector initiatives - agriculture innovation, life sciences, advanced manufacturing and logistics, energy technology and information technology - so we are in a unique position to seize opportunities for these high-growth and high-pay areas. The report emphasizes that the continued growth of these advanced industry companies is critical to ensure prosperity for our citizens and companies, both locally and nationwide. CICP's innovation and talent focus is uniquely positioned to advance the development in these key industries." Brookings says the sector in Indiana produces $74.3 billion for the region, accounting for more than 25 percent of all output in the region. Wages connected to advanced industries, the study says, pay an average of nearly $72,000 per year, compared to all other industries, which pay an average annual salary of just over $44,000. 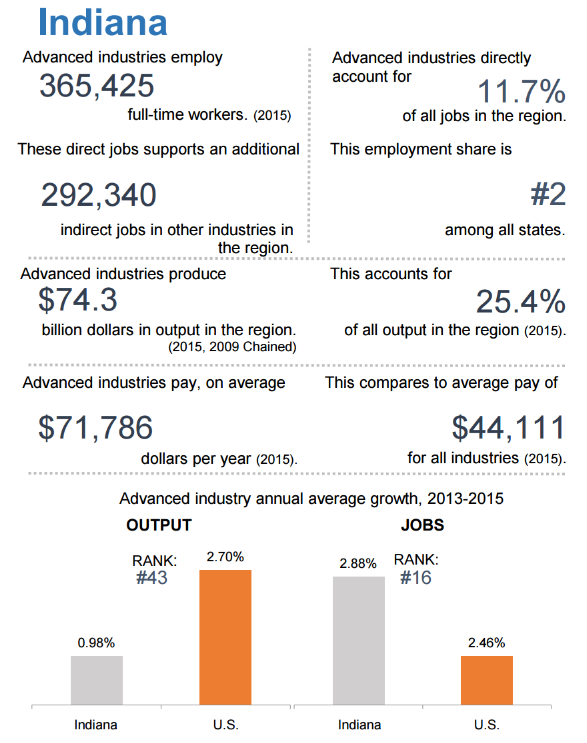 According to the study, nearly 12 percent of all jobs in the region are related to advanced industries.